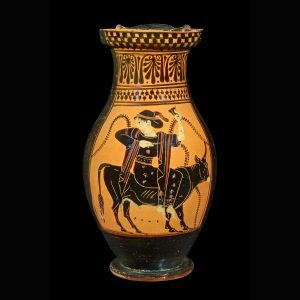 One would be tempted, indeed, to recognize here the famous mythological episode of the bull carrying off Europa on its back. In fact, the iconography linked to this myth shows the bull “galloping” at a certain speed, in an environment that suggests that the figures are flying over the sea, which is not the case here, since all the represented elements combined together clearly belong to the Dionysian universe. 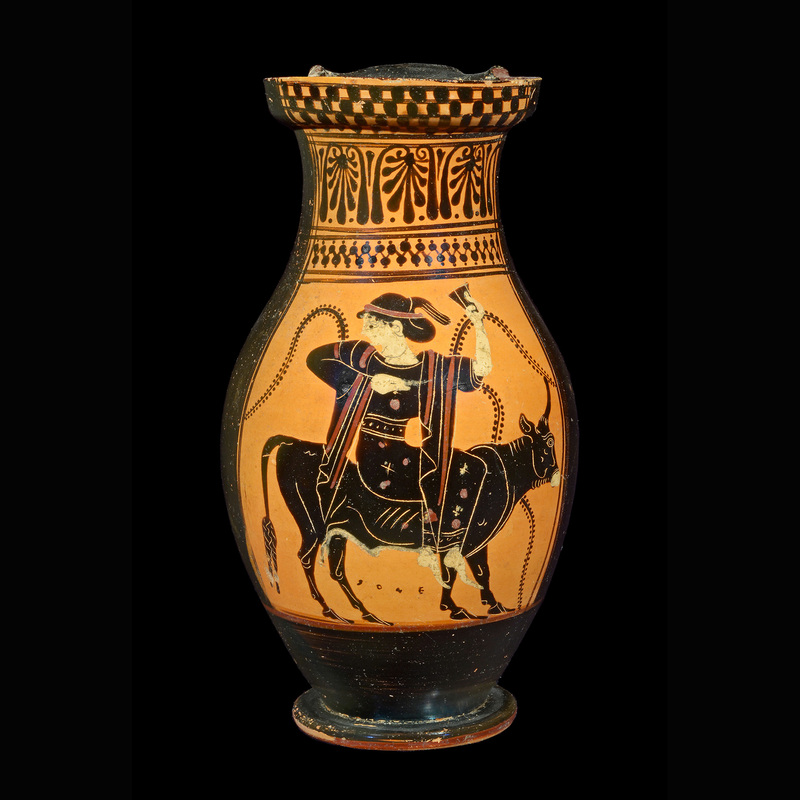 For this reason, one would rather identify the scene decorating this olpe as that of a maenad riding the god Dionysus disguised as a bull, in the context of a Dionysian procession, during which music played an important role (the maenad plays castanets). Several stylized ivy or vine stems adorn the background of the decor. Such details, sometimes associated with rocky elements, may suggest the entrance of a bacchanalian cave. 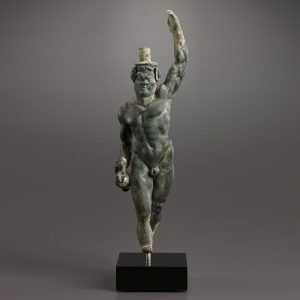 Dionysus being the god of euphoria and ecstasy induced by wine, the “ceremonies” would take place within the framework of hidden and initiatory cult services, held in caves and preferably at night. His worship took place among insiders, known as satyrs and maenads, grouped under the name of a thiasus, or Dionysian procession. Living in the woods and hills, satyrs usually have a human form, but they are also endowed with animal features, such as the ears and tail of a horse. They may sometimes have goat’s hooves; this might have been the case in this example, given the presence of the tenon indicating a foot made separately and then added, an element that links them more to Pan, the god of the wild. The satyr holds a small trefoil oenochoe in his right hand; in the same spirit as our olpe… The circle is complete!